This recipe is not really a recipe. It's more of a meal suggestion. 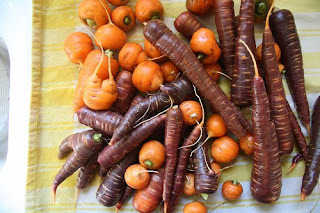 On weekends when I want something hearty that doesn't require a lot of thinking, I slice up carrots (including a purple one and a white one when I have them) and potatoes, and pan fry them in a thin layer of oil. The trick is to let them sit a little (don't stir constantly) so that they get crispy and awesome. They take about 20-30 minutes-- but I can usually take care of other things in the kitchen while they cook. The sweetness of the carrots really comes through at the end. It's an extraordinarily cheap winter meal. I first tried it in Eritrea, where they used a bit more oil; it was cooked to perfection on an outdoor stove.